COAT is a long-term, ecosystem-based and adaptive observation system. It aims to unravel how climate change impacts arctic tundra food webs, and to enable prudent science-based management. The baseline of the approach is conceptual models. These models guide the monitoring design that may include management actions. They also guide the structure of statistical models that estimate impacts and derive predictions based on the monitoring data (Figure 1). The approach accommodates three adaptive loops driven by (1) new knowledge, (2) needs of stakeholders and (3) new technologies/methods. (1) Climate change impacts on tundra ecosystems are often mediated and enhanced by trophic interactions. (2) Humans affect ecosystems by their involvement in food webs as harvesters and managers of ecosystems services and conservation targets. (3) Food web ecology has a strong scientific tradition in terms well-established general theories and development of new tactical models. Food webs are complex entities and simplifications are needed to accommodate the overall protocol of COAT (Figure 1). 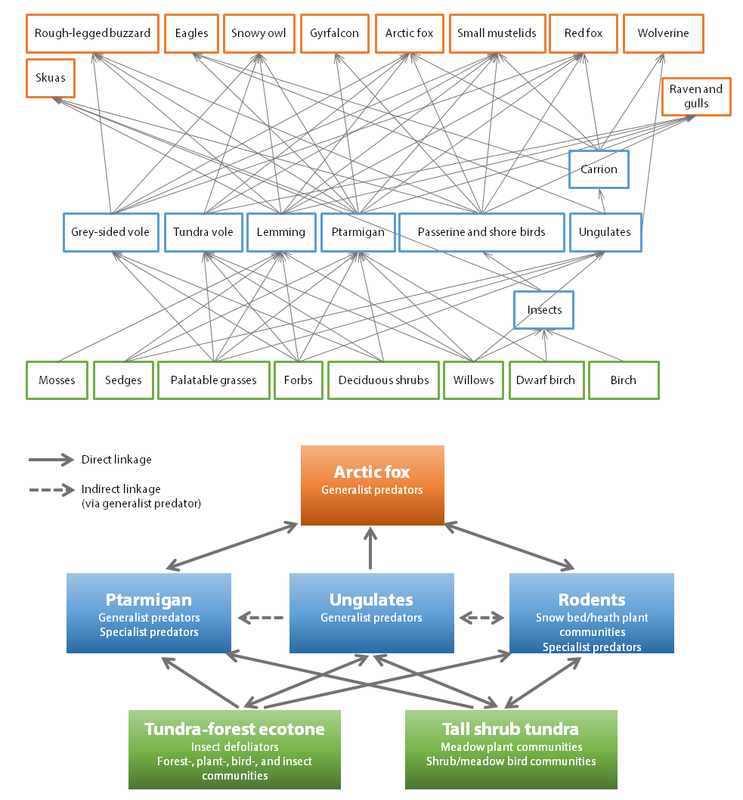 First, outlines of food webs for two targeted regions of the Norwegian Arctic – low-arctic Varanger and high-arctic Svalbard – lump many of the species into functional groups and focus only key trophic links. Second, the two food webs are further divided in food web modules – 4 for Svalbard and 6 for Varanger. Each of the food web modules includes a subsets of strongly linked species (or functional groups/species assemblages) that have high climate sensitivity and key functions. Key functions can be either ecological and/or societal. Each module is named by one of it primary monitoring targets - often the one with the highest management relevance. Naturally, the different modules are linked in various ways and this is further specified in the conceptual models. Figure 1. The adaptive approach accommodates three adaptive loops driven by (1) new knowledge, (2) needs of stakeholders and (3) new technologies/methods. 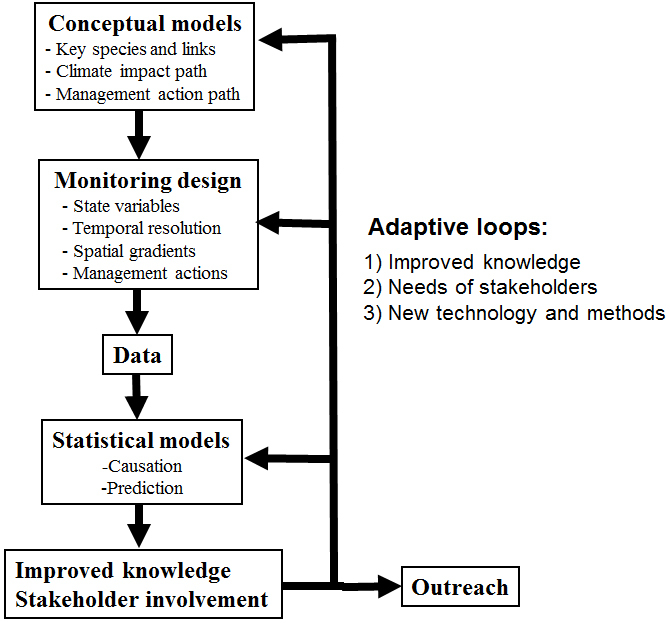 For each food web module, a conceptual model specifies the biotic links between monitoring targets (species or species assemblages) and expected impacts of climate change and management actions (Figure 2). These conceptual models define what shall be monitored (monitoring targets) and how state variables characterizing the targets shall be monitored and analyzed. The conceptual models thus define the monitoring design used to acquire data and the structure of the statistical models. Each of the conceptual models/food web modules are linked to other models/modules as they may include common monitoring targets. Figure 3. 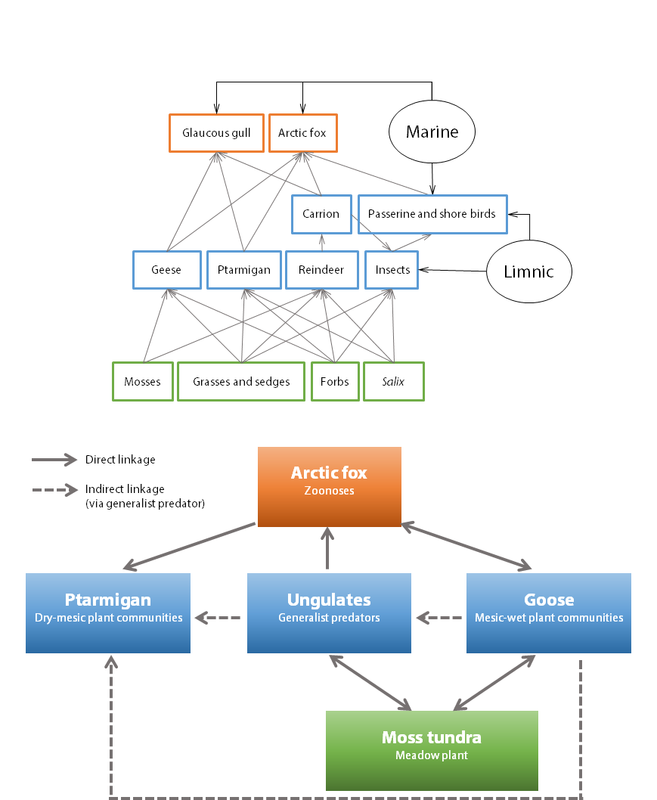 The principle structure of COAT’s conceptual models that outline impact pathways of climate change and management actions on strongly linked species and species assemblages (Targets) in a food web module.